Cybele Malinowksi and I are having a photo show at Mart Gallery in Surry Hills (156 Commonwealth St) starting this Friday 12-5pm and continues for 2 weeks. The show comprises 24 music magazine covers that feature our photos, including Drum Media, The Brag, Time Out Sydney, jmag and Mess and Noise. 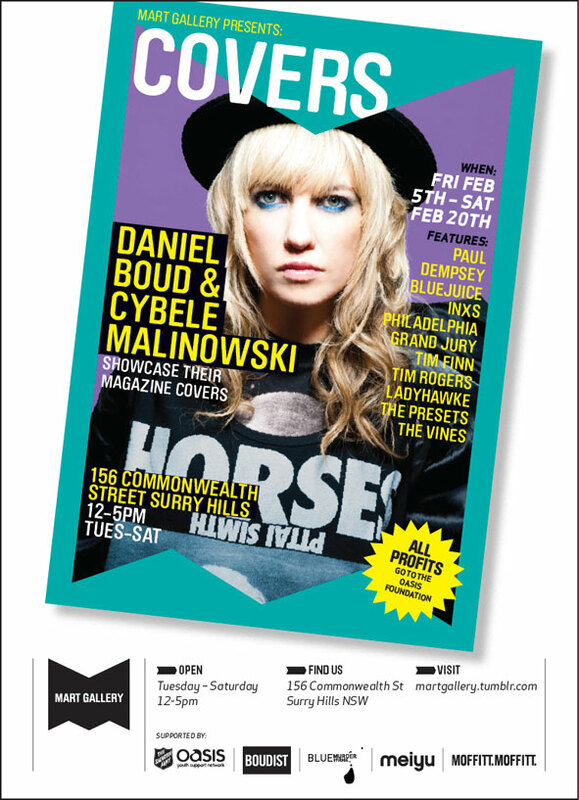 Artists who feature in the photos include bluejuice, Ladyhawke, Philadelphia Grand Jury, The Presets, INXS, Pnau, Paul Dempsey and more. Before the show, Cybele and i were racking our brains thinking of what to show. It was on open brief – it just had have something to do with music and art. We toyed with the idea of creating new work, but found it hard to agree on anything, nor did we have time to put any grand schemes into action. We decided to exhibit our catalogue of music magazine covers. Most of the music stuff we shoot these days is commissioned work – portraits of bands for publicity and editorial use. So it made sense for us to show the photos in the mode they were intended, which is usually for the covers of magazines. Plus Covers was a cool title with music connotations. I’ve always been a consumer and aficionado of the music press, so the show is a celebration of them too. We all love the internet – but for me, music is forever entwined with magazines and photography. It’s where my love of music photography was borne – as a teenager pouring over music magazines, ripping off their covers to stick on my bedroom wall and cut out photos of my favourite bands for my school books. It’s quite a thrill to be able to show some magazine covers that we photographed ourselves. Cybele and i have been doing a bit of spruiking in the lead up to the show, with stories in the street press (shame old-media doesn’t put that stuff online), a feature in Pedestrian, a recommendation from Time Out and an interview in Side Street Sydney. The pictures will be for sale, with all profit going to Oasis Youth Support Network. There’s a Facebook event with all the info too.